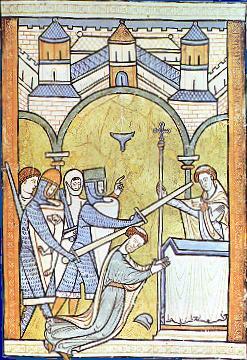 No event shook late twelfth century England as much as the cold-blooded murder of the Archbishop of Canterbury Thomas Becket in his own cathedral. The knights who plunged their swords in to him as he clutched at his altar believed they were doing the will of king Henry II, ruler of Normandy and England. Thomas had been born in the same year the Knights Templar were founded – 1118. He came from a prosperous Norman background and had been mentored as a youth by Theobold, a previous Archbishop of Canterbury. Through him he had met Henry II and the two men had become firm friends. Indeed the hot-headed king had even elevated Thomas to the position of Chancellor – the top secular post in his realm. As Chancellor, Thomas was in charge of all financial matters and he excelled in his duties. So when Henry wanted to bring the church more under his control, he thought it might be rather a good idea to instal Thomas as Archbishop of Canterbury – the top religious job in England. The small matter of Thomas not being a cleric was resolved in the traditional medieval manner of a rapid ordination and shortly thereafter he was wearing the bejeweled mitre. However, Thomas went native in his new role – in no time he was defending the church against the king. Henry operated on a pretty short fuse at the best of times – eating straw off the floor and growling like a dog during some of his worse tempers – and he was soon trumping up charges of financial impropriety against Thomas dating back to his time as Chancellor. The Archbishop fled the country for several years but was then reconciled to Henry. Everything, the king thought, was going to be sweet from here on in. But Thomas, who clearly had an obstinate streak of his own, refused to let Henry exert royal control over church courts and in one volcanic fit of fury, Henry wondered loudly ‘who would rid him of this turbulent priest’. A group of knights didn’t need a second prompting and made their way to Canterbury, swords in hand. ← Priests who kill – ordained warriors in the Middle Ages! The Kings Knights – were they Templar Knights, or just protectors of the King. Very important to explain the difference.